It was excellent weather and playing condition were perfect last Saturday ! We were up against the dutch, Oranje FC in the SIFL. Our strength on the day was our excellent bench as we had a big and motivated squad. As for Oranje FC, they tried to keep the clean-sheet as long as they could. In the first 25 minutes we created some opportunities but failed to finish it off, shots went just wide or were blocked by their goalie. On the rare occasions that the Dutch were coming over the middle line we took advantage by quick counters. Azz opened the score on such an occasion and just before half time he scored our second. In the second half we focused on scoring more goals as the goal difference is always important at the end of the season. All players coming off the bench made an impact first Nicolas who kept his goal scoring pace in tact as he scored twice followed by Gwen who almost wanted to retire from football after his goal ! 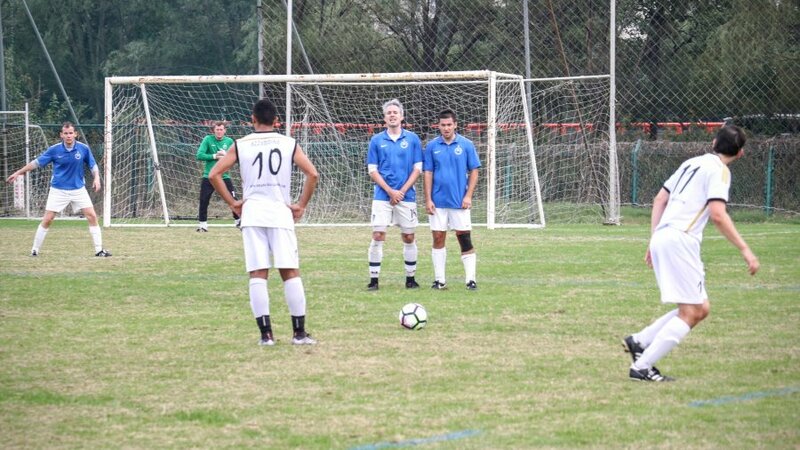 Our debutant Jona also found the net and Kevin failed to score from a very close range. 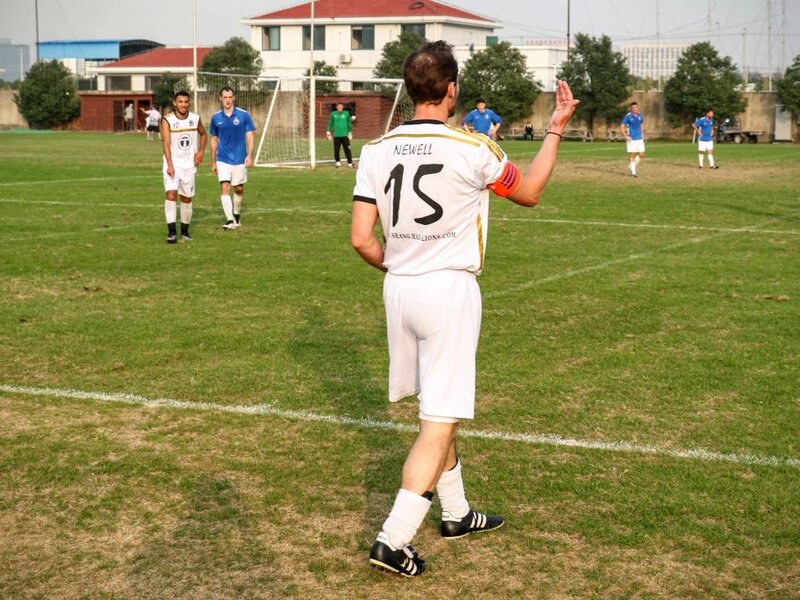 A slip of concentration gave an opportunity to the Oranje FC which they happily took as they made it 6-1. 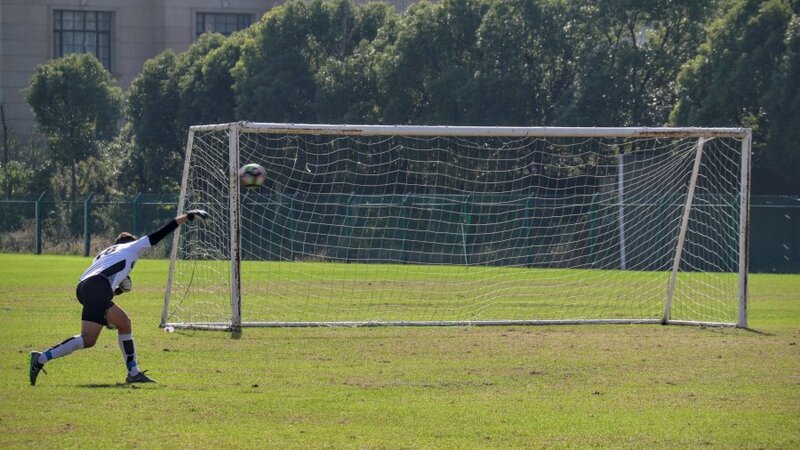 Last but not least our young local player Xu Ling scored as well to make the final score 7-1 for the Lions. On Sunday the weather was still good 22 degrees which was pretty warm for middle of November. Again we had a large squad and again the hungry bench proved to make a big impact on the game however our opponent were our old rivals the Marlins so we knew we were up for a tough game. Our plan was to play compact and patiently wait for one or two counter attack. It went well in the early stages as our defend stood well and we got a few fast counters. However the Marlins took the lead after we couldn’t clear the ball. The second half talk we focused on being positive as we knew we can turn things around. 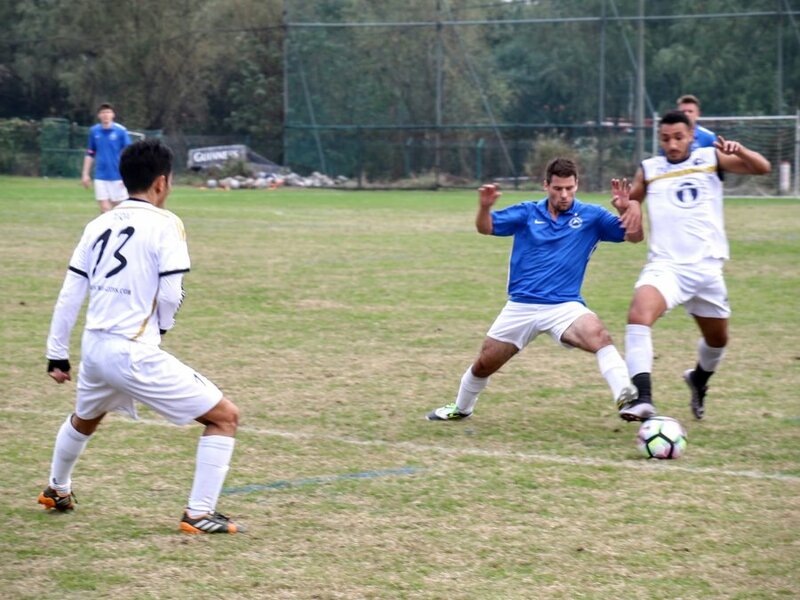 We quickly equalized by a great header from Fabie and the Marlins started to show some cracks mainly because we upped the tempo of the game and their midfield imploded. Felix took on their defense coming free on his left foot and had no problem to put us ahead. Jona scored again 5 minutes later another debut goal from him with a blast that the Marlins goalie only could see going in as it was a great strike. Nicolas proved his killer instinct as he scored again as well. By now the Marlins collapsed and we kept trying to score more goals. 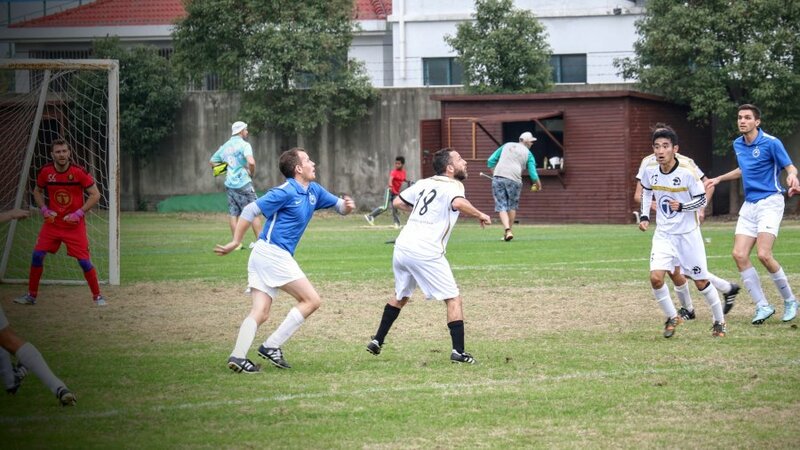 Good old Tomas scored twice and laid one off to Xu Ling. At the end of the game all of us were not sure about the final score as we scored so many in just 45 minutes that we lost track, however in the end it stopped at 7-1 and a well deserved historic win over the Marlins was a fact ! 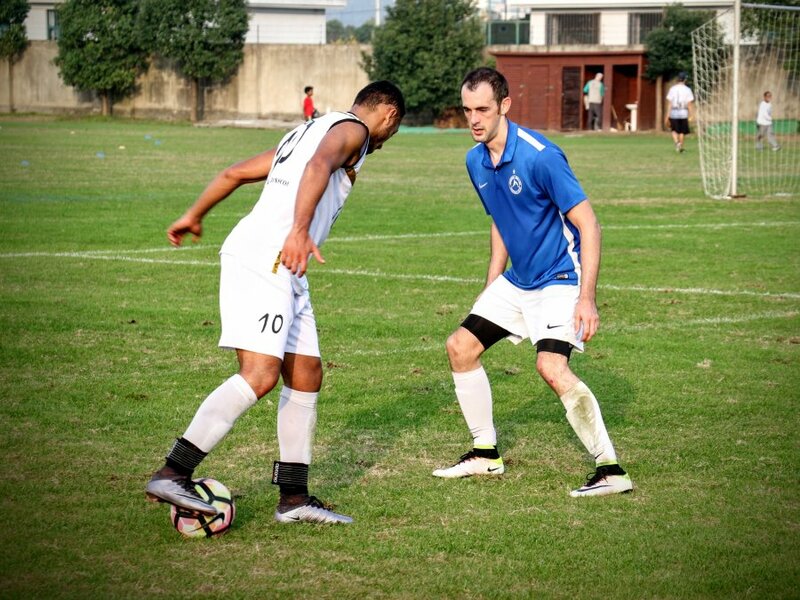 Our strength on the day was our bench and our combination of experienced Legends and 3 young players who all played very well combined with an inform Dim and rock solid defense and a very motivated (seems he got a good reason) Azzeddine ! Well done Lions ! Two 7-1 wins surely lifted our spirits now let’s all come to the training and work even harder for the big games ahead of us ! Coming weekend we play Reunited on Saturday and the Legends will play the Super 48 Master Tournament ! It is good to be a Lion ! [SPL News] SPL is back on track ! 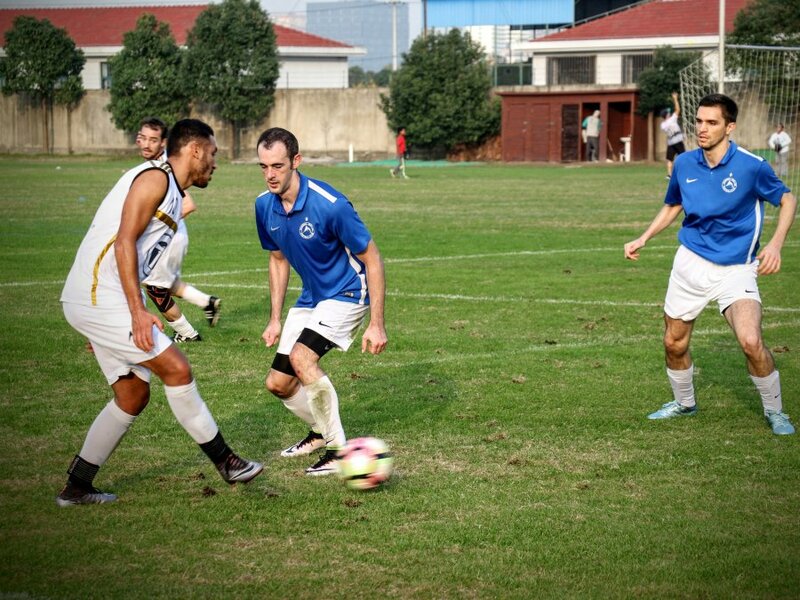 October weather is always good in Shanghai and last Sunday the playing condition were excellent 25 degrees and green grass at SCSC. Jinqiao finally had their family day last weekend as it caused some trouble to us due to their postponement by a week. Century Park will be back this weekend after winter grass seeding and will be in top notch conditions ! 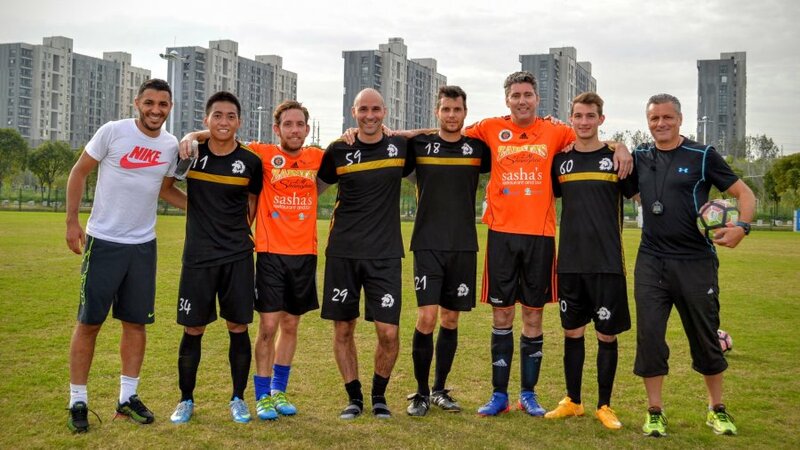 Peter Rosselli of the Marlins is writing interesting articles about Chinese football on the website of Wild East Football. 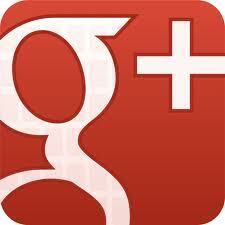 Its definitely worth a look and a read ! The Chinese never ending Football Story is going on and on and the amounts being paid for foreign coaches nowadays are completely out of this world we will have to worry that one of these days Bilgin or Steve Fishwick will be no longer in the SPL but in the CSL. Rumors are going around that Steve will succeed Erikson at SIPG but the contract is still pending on some undisclosed minor details…..! 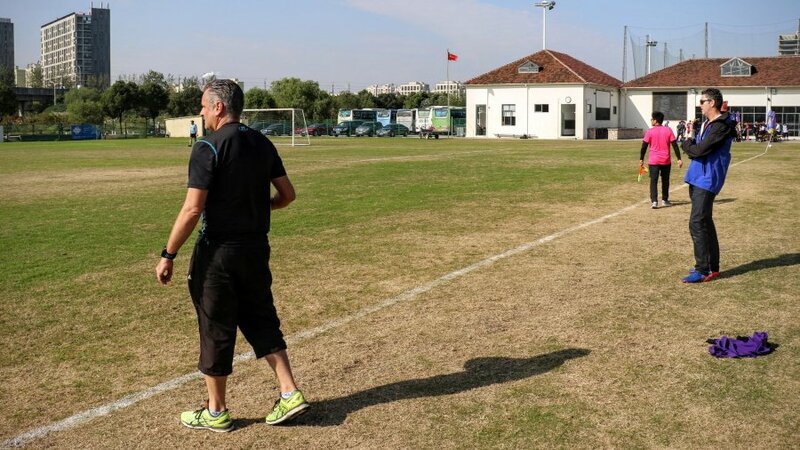 Bilgin finally was back and the had 11 players on the pitch as the week before they won with 9 players ! ERS is the team in form at the moment one good point about them is that they play with the same team and formation week after week. 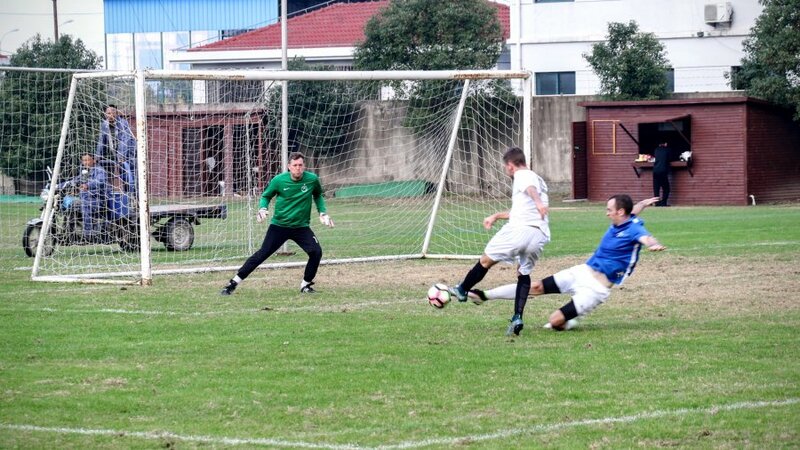 It showed as they scored after 40 seconds after Gonzalo the Krauts defender thought he was Maradonna in their own box ! 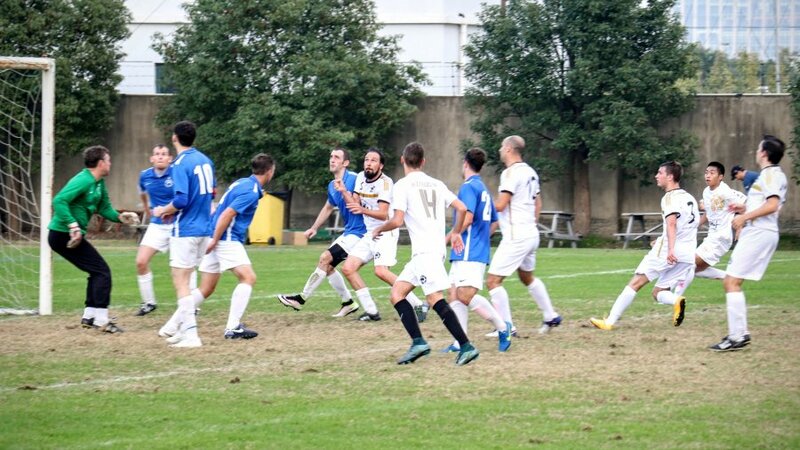 The second goal was an easy catch for the Krauts goalie but maybe he got nervous by Bilings presence and let the ball fly in the goal 2-0. If that was not enough the 3-0 was another gift too early for Christmas. 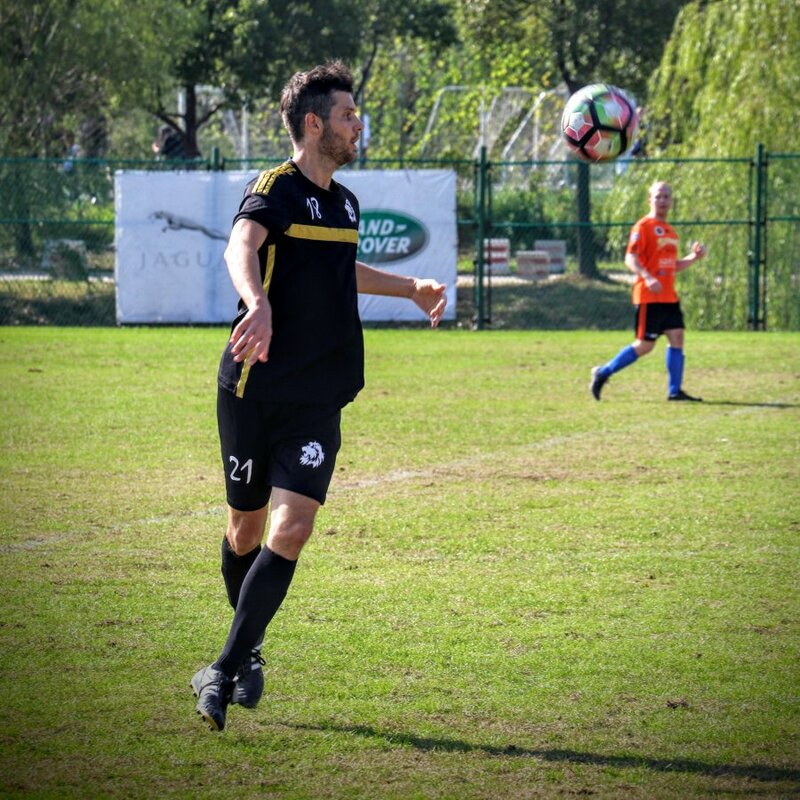 Stas arrived only in the second half and the Krauts started to play better with him but another gift made it 4-0 and the final gift was from the linesmen to make it 5-0. If that was not enough for the Krauts Bilgin missed a penalty to make the misery complete ! Good result for ERS and the Krauts will bounce back against Century Park in two weeks ! Japan is always able to give the opponents a hard time due to their fast play and good fitness level. This time it was not any difference as they took the lead the Lions goalie didn’t clear a cross in properly. Japan was faster and quicker in the beginning of the game and the Lions could only stop them by making some fouls. They got some chances as well and a long strike of Tomas ended in the top corner. Soon after it was Felix who finished well after a quick counter. While the Lions were celebrating Japan was ready for the kick off and Nakano-san the Japanese striker had other ideas as he shot a thunderbolt over the Lions defense and also over our helpless looking Dim, …..2-2 ! In the second half the Lions played much better and more serious as they knew a draw would not be good enough. 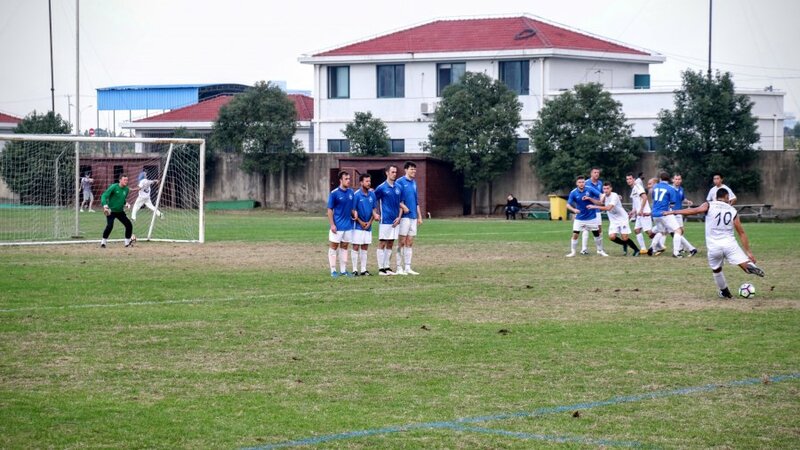 They created plenty of opportunities but either they shot just wide or the Japanese goal keeper saved their efforts. At the final end Japan even got a chance for the winner but they hit the post and saw Dim putting out a ball at the very last moment. Compliments to Japan who indeed gave the Lions a hard time ! This time it was harder for the Galacticos as the Marlins are also in fine form they couldn’t find the net on the otherside the Marlins scored thu Jamie Lally 3 x Wilson 2 x Gui 1x (left a hole in the net) Tony 2x Pete 1 x Steve 1 x and Mossy 2x. 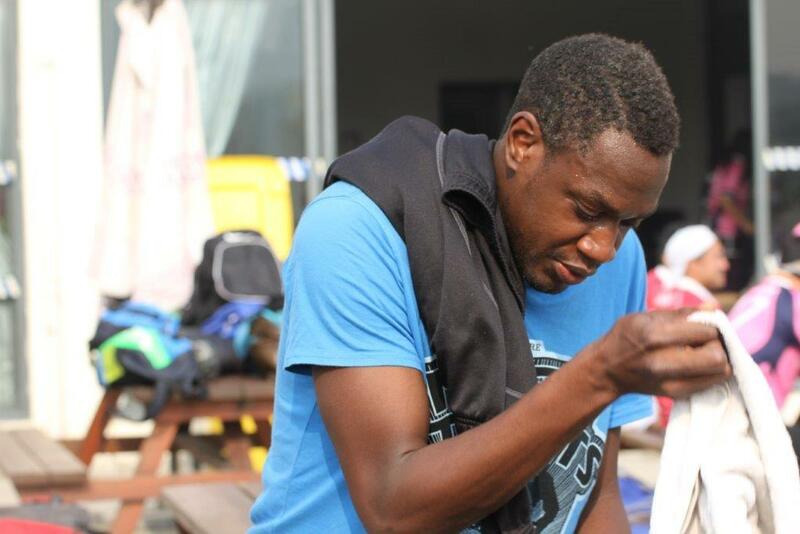 The big question left is why Dale was not on the Marlins goal sheet…..? We are very pleased to have the Century Park field back in action this Sunday with two games ! 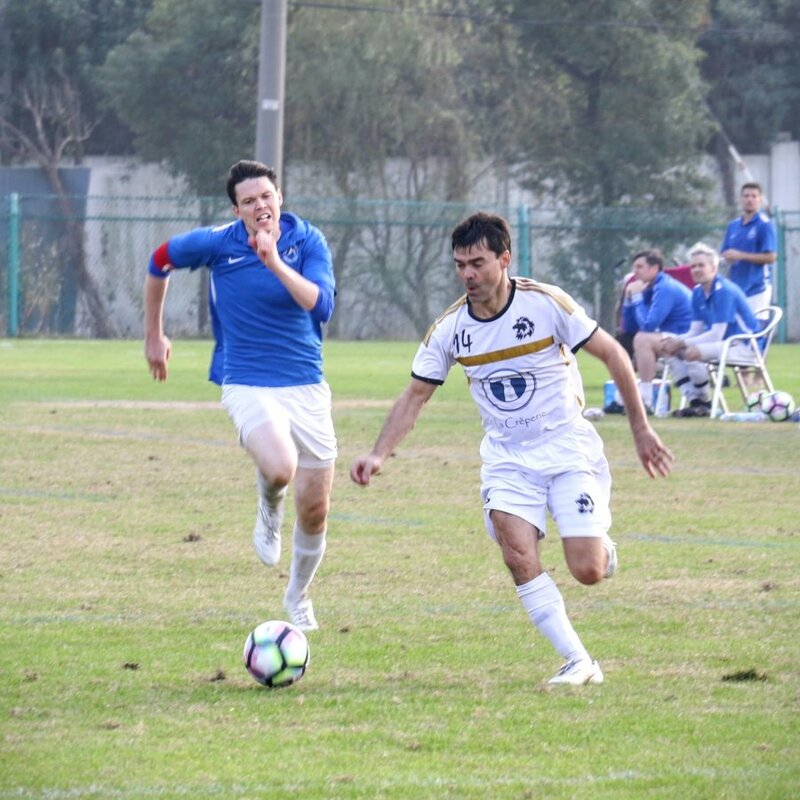 Enjoy the games as winter will arrive soon in Shanghai and they predict much cooler temperatures than normal which is great for the SANTA CUP ! 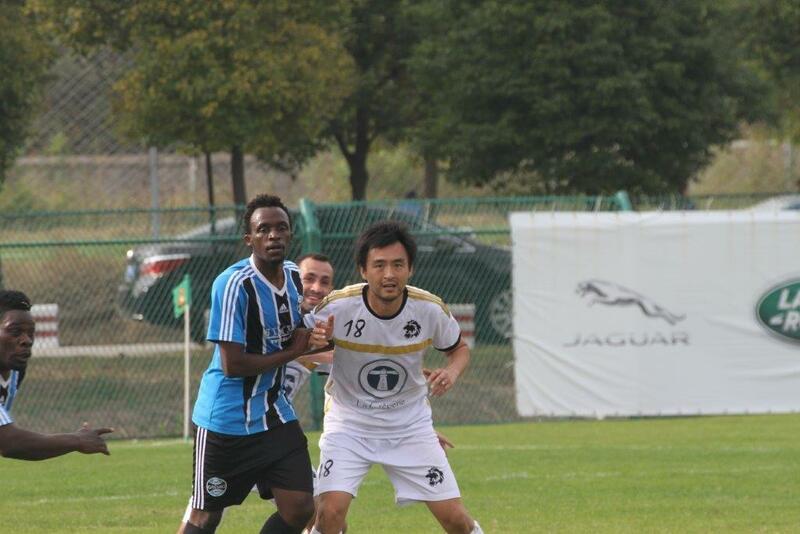 [SPL News] Marlins see red but stay on top of the SPL ! 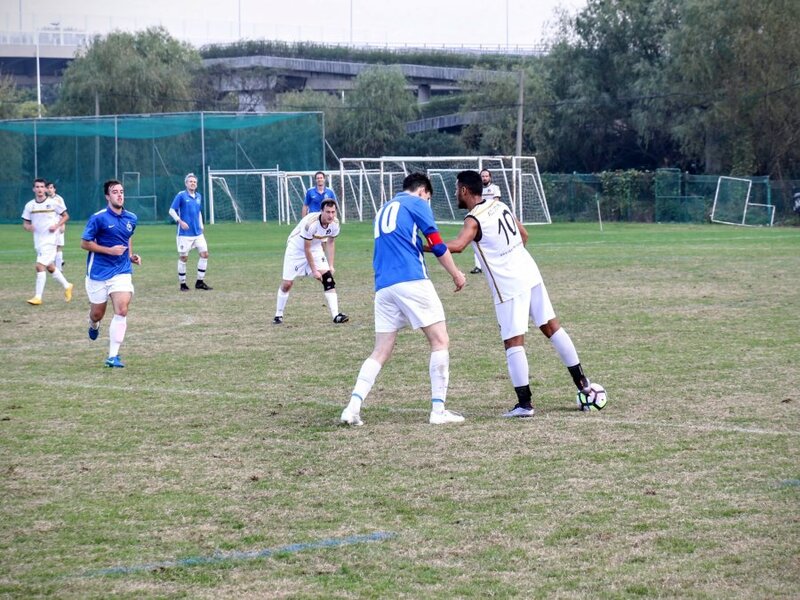 Last Sunday October 16th, 2016 we had good playing condition unfortunately only two games as Galacticos had two team events on the day and couldn’t field enough players. No Bilgin and No Manu but plenty of players for the Krauts ! Statistics of the Krauts winning games while king Bilgin is not there are not looking good as it would be a single digit figure. Marlins started strong and scored quick by James after a one two with Pete. Soon there was a second after a goal keeper error scored by Jamie Lally. 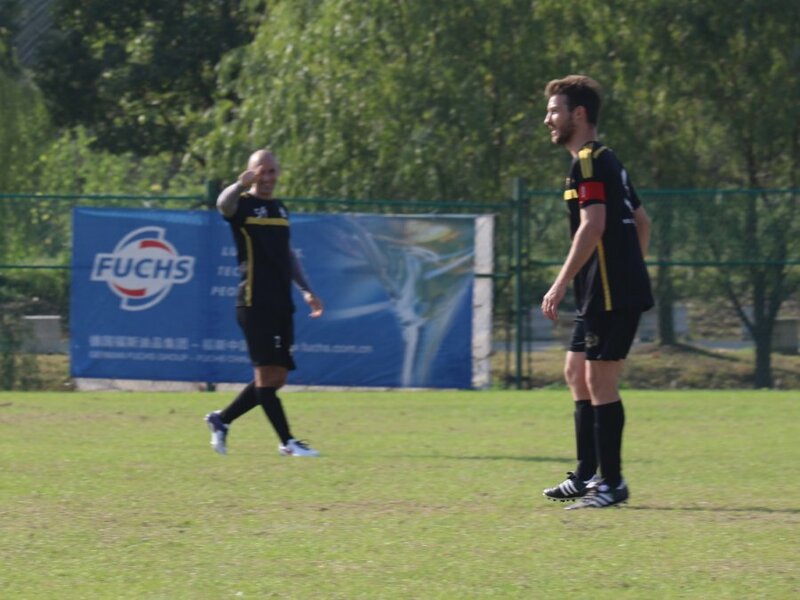 The Krauts kept trying hard on fast counters and succeeded by a fast break on the wing and good finish by Gonzalo. Pete of the Marlins made it 3-1 with a fine header after a good cross. 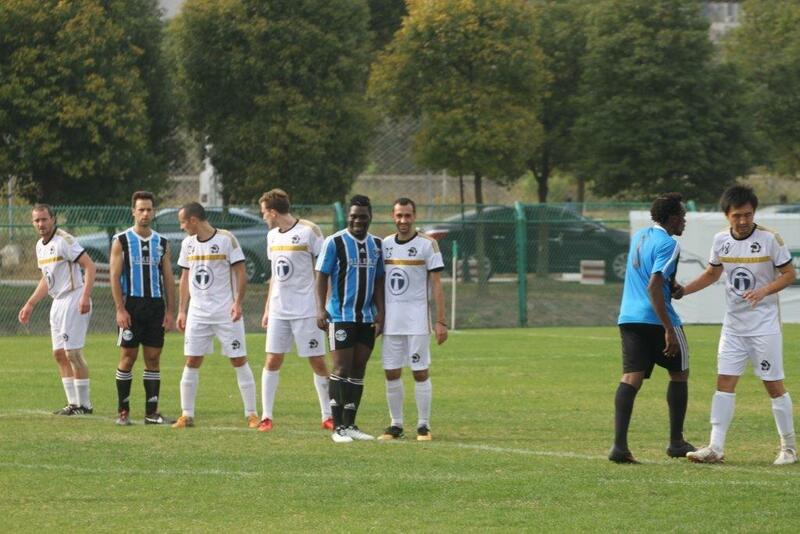 With half an hour gone there was a bust up between two players of each team and kevin gave them the marching orders. Bad luck stroke again for the Marlins as Ash Reid was unlucky to rupture and Achilles tendon and will be out for several months (We wish him a speedy recovery !). James scored his second for the Marlins just before half time. 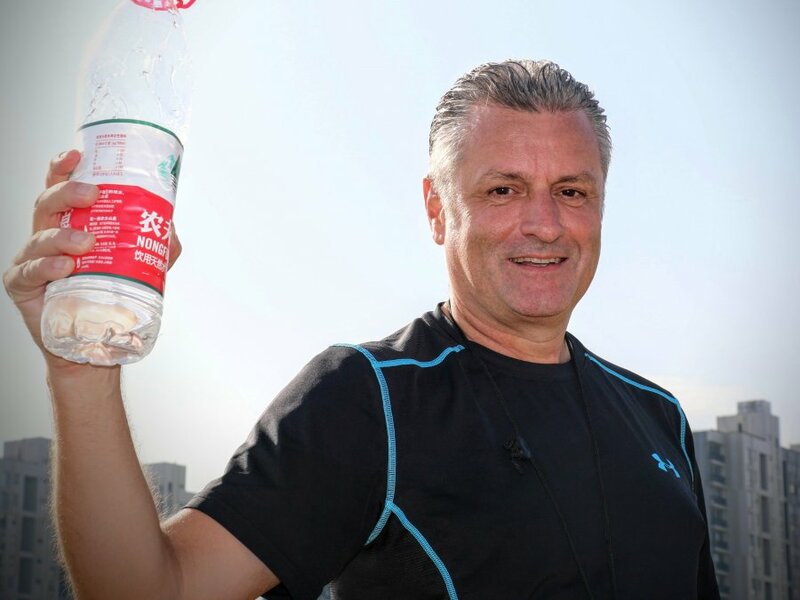 In the second half it was more of the same but when Banksy committed a professional foul it was his second yellow and Kevin ordered him to shower early ! Marlins left with 9 players only still managed to score two goals by Jamie G and James for his hat trick ! Usually its Japan who are the best prepared for the start of the game but this time Century Park scored after 4 minutes by Fafa and soon scored their second by Shingi who scored two minutes later. Japan had to run behind the facts for the rest of the game and to finish of their solid performance they scored their third goal with 5 minutes to go by Shingi again. 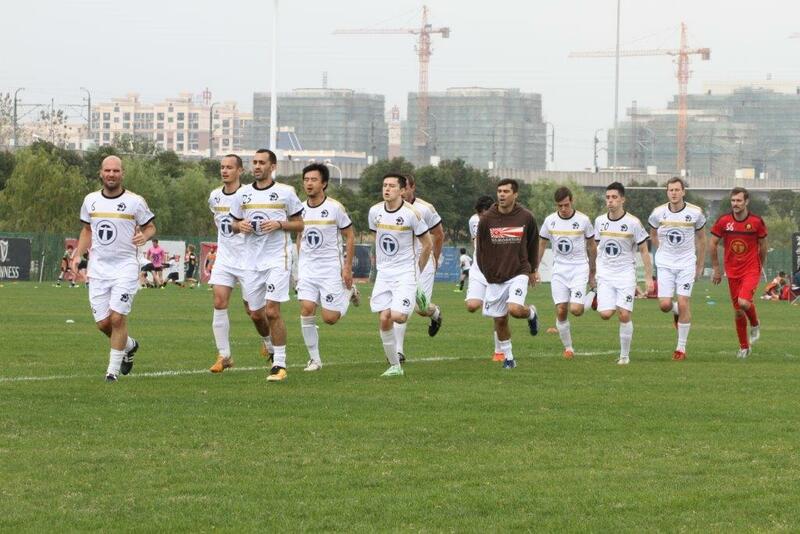 This weekend we will have three games all at Waigaoqiao and the outlook is for rain but we should be good to play ! All good things come to an end. The SPL season is no exception ! 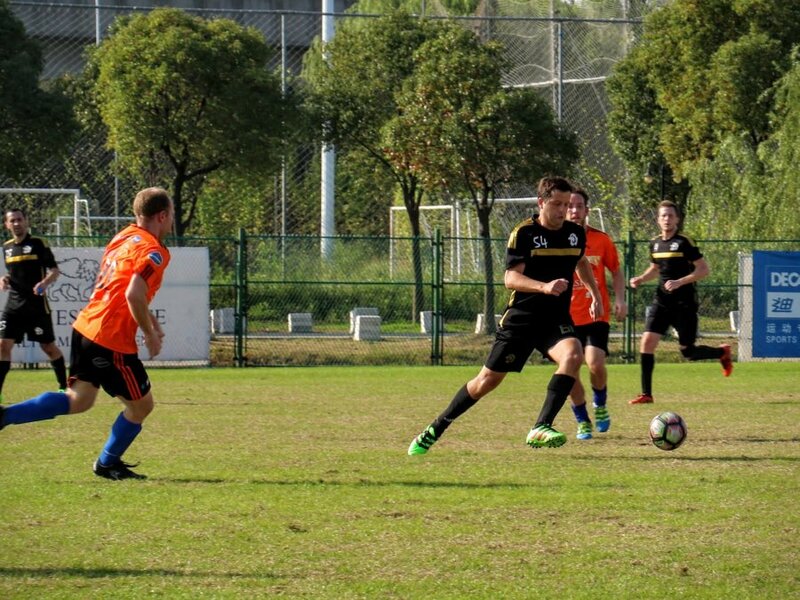 We had three games to play before we could evaluate the final ranking and performances of the teams. The weather was good and this season we have been lucky with the weather ! No complaints to the weather gods from our side ! There was nothing at stake anymore in this game and the atmosphere was very friendly. 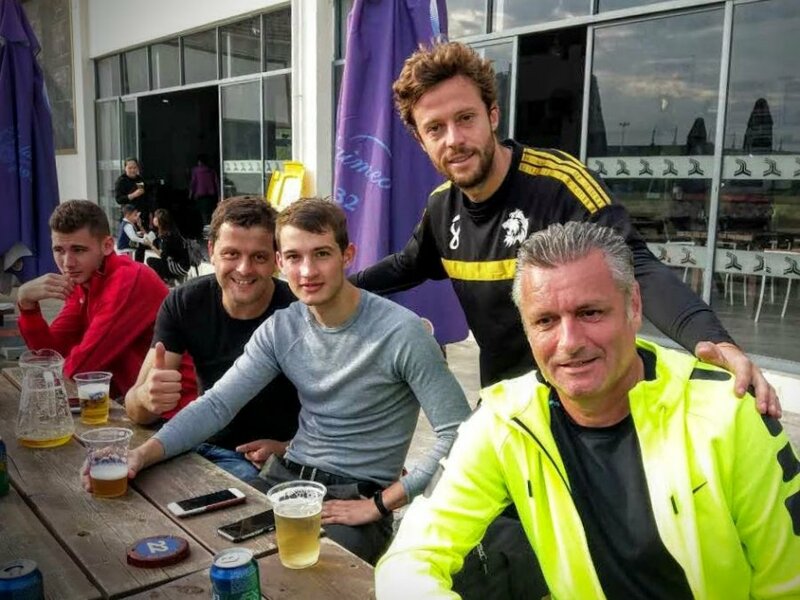 Leftovers from Frederik’s goodbye Shanghai Party were shared between the teams and the referees. ERS scored first and after that it was a festival of missing opportunities for the Flamenkos. Sharing the points and the friendship was a good way to end the season for our number 5th and 6th of the SPL ! Despite the high score line the game was always good in sport and credit to the Galacticos who never gave up to try and score a goal. Marlins were happy with the result and ended up drinking away the Shanghai Beer Stock in Blue Marlin after the game. Banksy in person closed down the establishment in the dark hours of the night ! 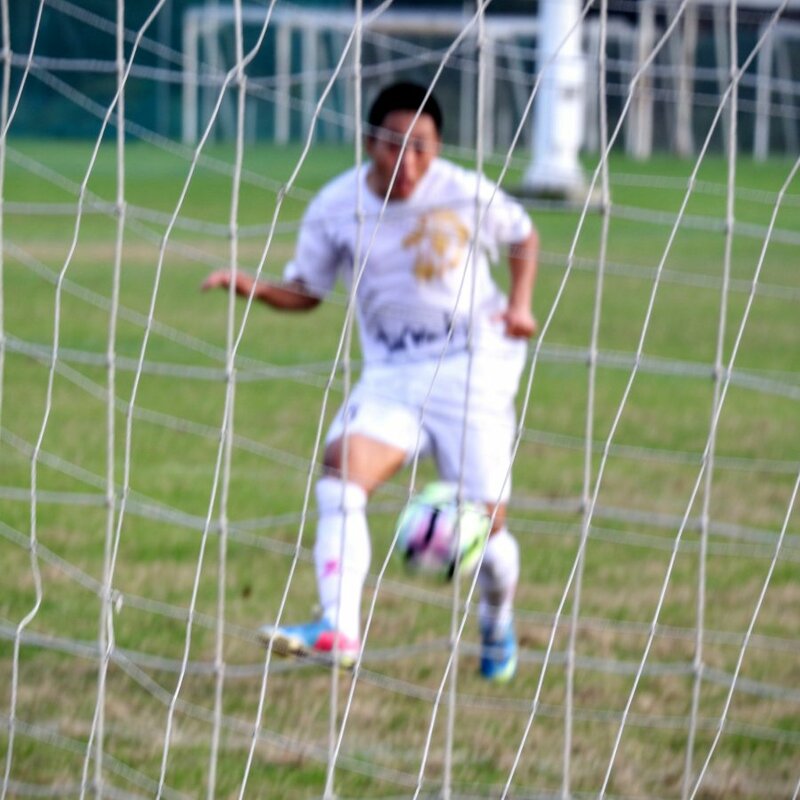 It was hard for the Shanghai 2000 players to stop Zhuang our SPL top scorer ! He just never stops scoring goals. First half it was 0-5 and luckily Shanghai 2000 could score a goal in the second half as they missed a few opportunities in the first. Looking back it was an amazing season with hardly any incidents. I think that’s a great achievement of all the managers and players of the SPL ! Of course the Referees and the Grass-masters have done a fantastic job every week ! Its the confirmation that we are on the right track in the SPL. In the SPL we all respect our opponents and we respect the game of football and yes we battle for 90 minutes but afterwards we shake hands and have a chat or a beer to talk about the game. 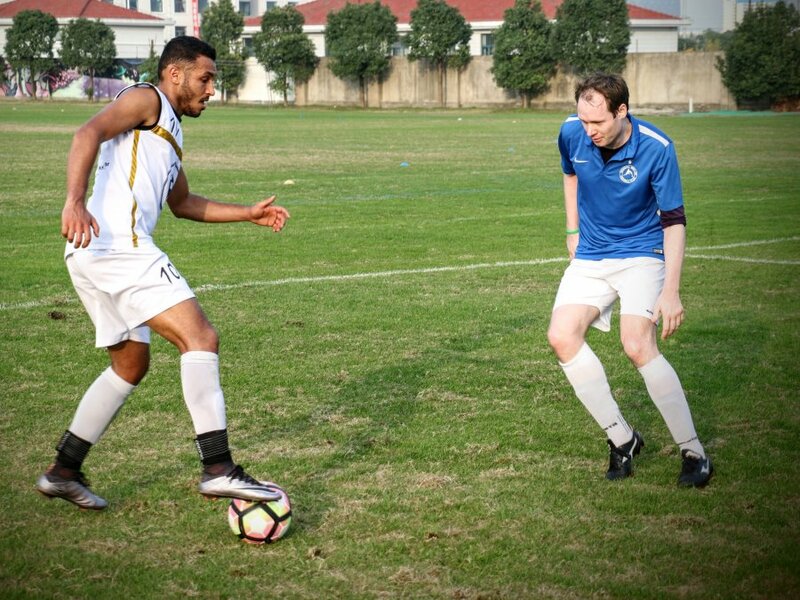 We played a record 110 games at the three best locations in Shanghai ! 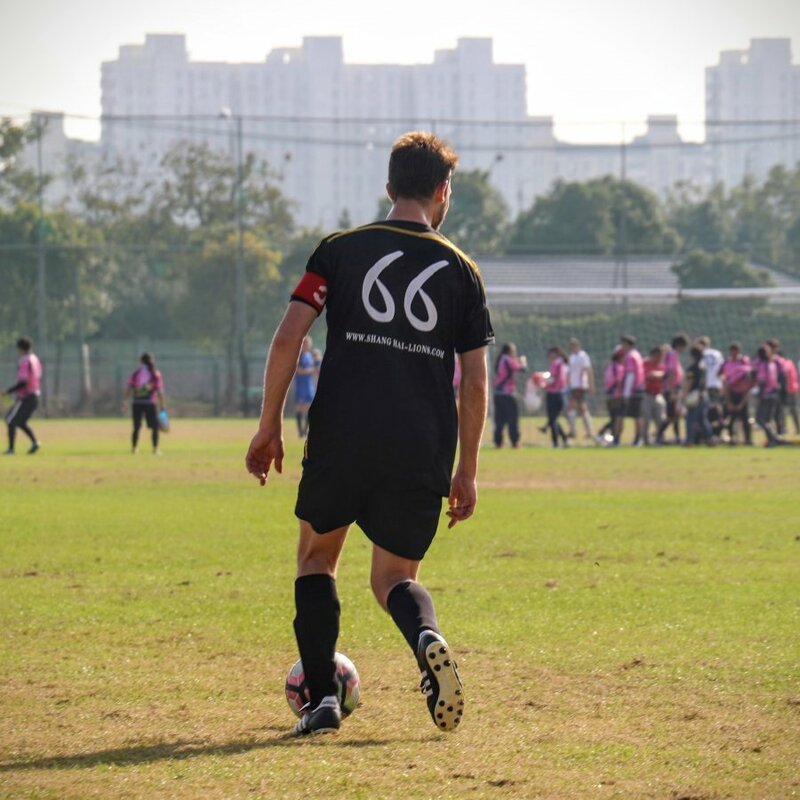 Total goals scored 698 ! We will wait until the 16th of June at our end of the season party to put everybody in the spotlight. There will be plenty of awards to give away ! Don’t miss the party. 11th Galacticos – Difficult season for them as they struggled to have a solid team base after a few key players left last season. What stood out for me was their spirit and the love for the sport. 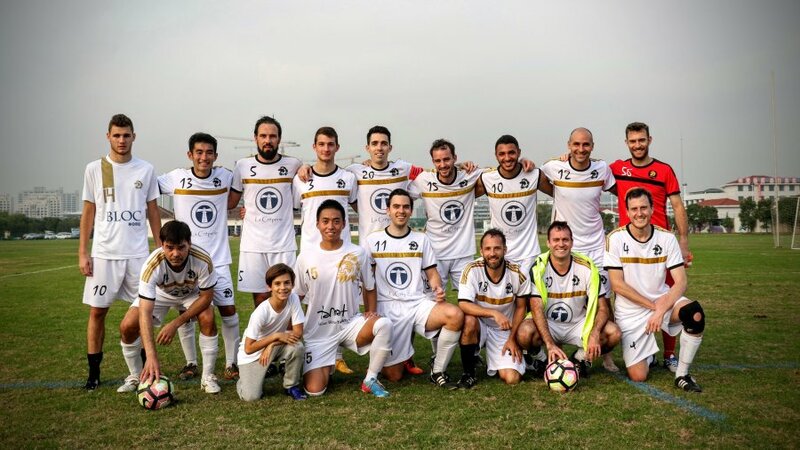 Losing almost every week is hard for any team, but the Galacticos never ever gave up and still managed to have fun during the games. If they can get a solid base group of players together next season they can be back at their best ! 10th Super 48 – Despite ending close to the bottom of the SPL Super 48 had their best seasons ever. They gave many teams a lot of trouble and the highlight for them was their victory over the cowboys. If every game was only 45 minutes long they would end up in the Top 6 of the SPL no doubt about that. They are a big contender for the Fairplay Cup this season. As well its rumored they will change their name to Super 38 next season ! 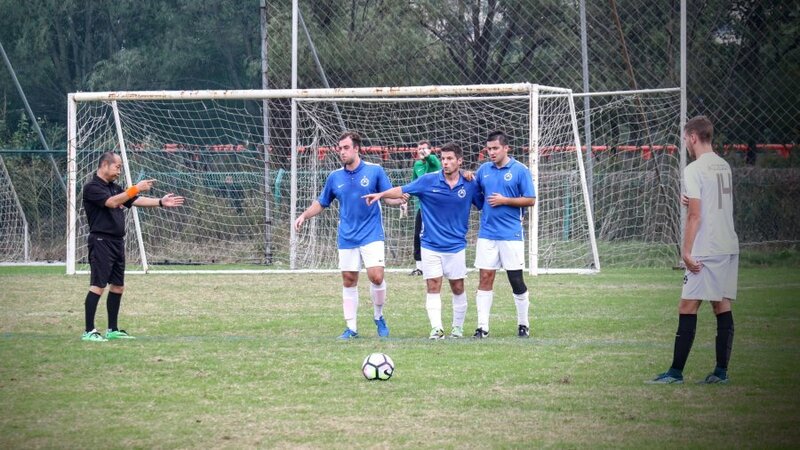 9th Pistolera Bulls – Looking at the performance of the Bulls this season it’s obvious that with 91 goals conceded they had their problems in the defense. I have seen games where Bilgin opted for a one man defense, most of the time himself. In this way he could collect more yellow cards and in that sense the strategy worked. Overall fitness level is another point of concern for the Bulls as they are not getting any younger and some of their players need to carry the extra kilos. 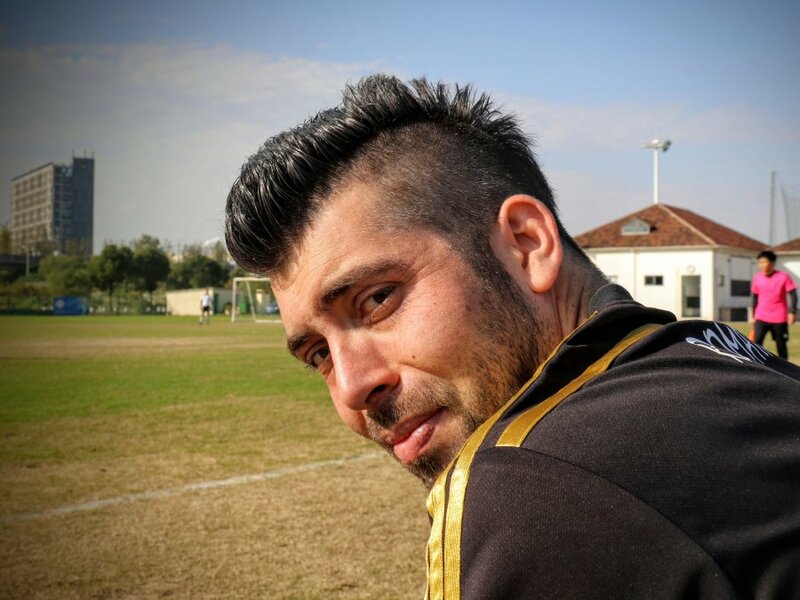 Bilgin is working on a mega deal with the largest fitness center operator in Shanghai to get his player back to their old level. Scoring is no problem for the Bulls with over two goals per game on average ! 8th Japan – This will be the lowest ranking for Japan in the SPL. One of the problems is that their top striker only scored 8 goals. If they could have scored more than their 46 goals they would easily have ranked 6th place or better. 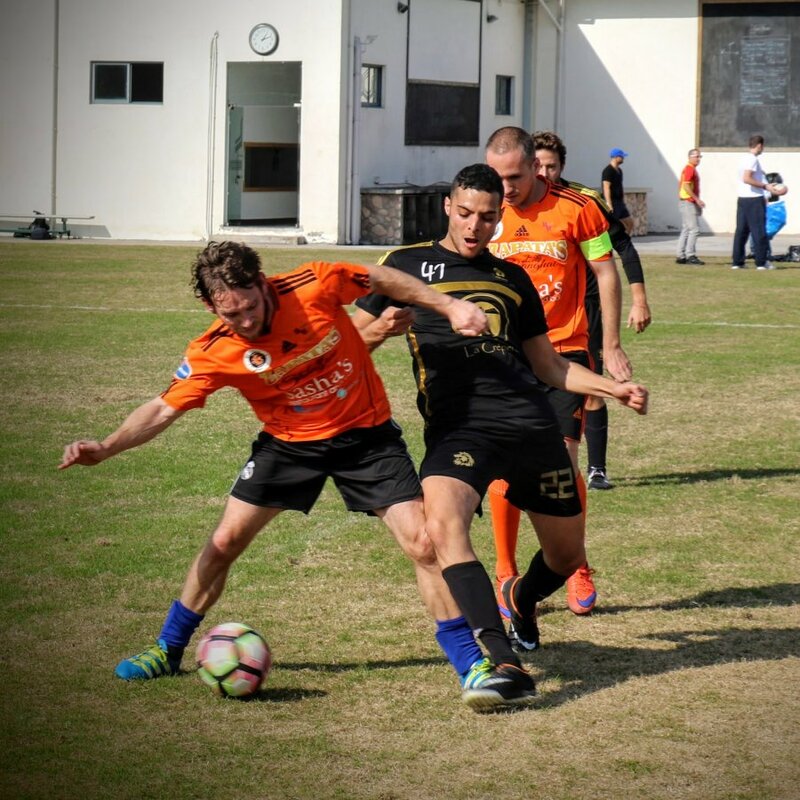 Of course their season had highlights as well a come back to clinch a draw versus the Flamenkos after being down 5-0 will be remembered far beyond Tokyo ! A draw versus the Lions as well as its not easy to take points from them. We expect a better performance from Japan next season ! 7th Shanghai 2000 – Our rooky of the year ! Playing on the super pitch at Century Park as their home ground we can conclude that they had a decent first year in the SPL. 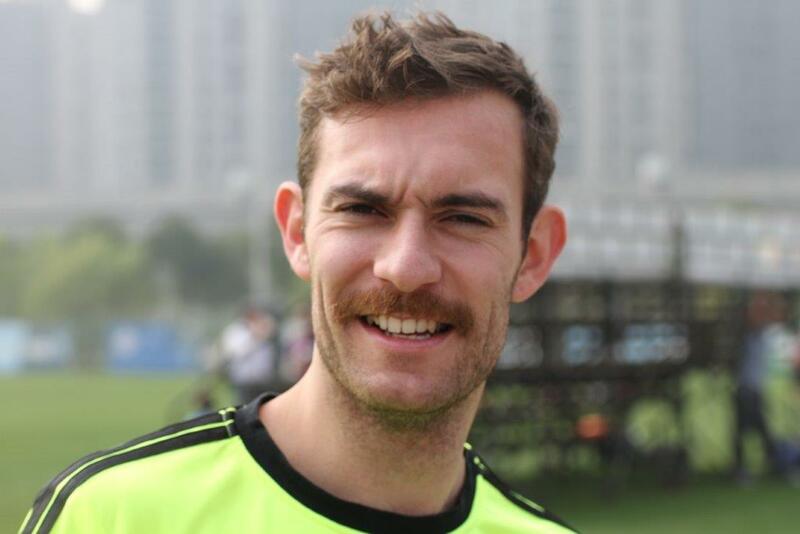 Too bad that their top goals scorer Hugo had to leave China half way through the season but still they managed to score 63 goals. 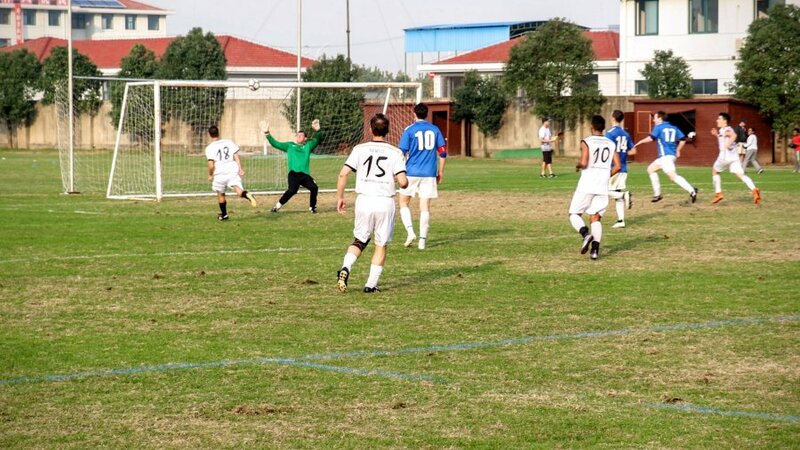 Shanghai 2000 are a team with experienced players and a good disciplinary record. In China that’s a good asset to own besides many properties ! 6th Flamenkos – If only everybody would have come to each game they promised to come they would have been in the top of the SPL. A mix of Champions League games / Formula 1 / El Classico’s resulted in a small squad. If everybody was present they were a hard team to beat. With only 53 goals scored it as well were the missed opportunities that kept them out of the title race this season ! 5th ERS – A few very good players left at the end of last season. 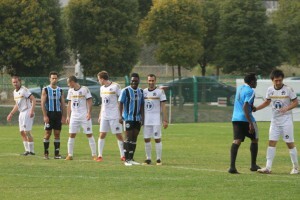 It resulted in a difficult first half of the season. It was their teams spirit that kept them alive and after Chinese New Year they had a very good run of results. Scoring goals was their problem you cannot blame their strikers as together they scored 50 pct of ERS’s total of 44 goals. A good scoring midfielder will surely send them in the top the SPL next season. ERS scouts are already searching the globe ! Fifth place out of 11 teams is not a bad result ! 4th Marlins – Before the start of the season Steve disclosed to me that their strategy was to win the SPL on goal difference in the final game of the season. For very long it seemed to be the right choice. They ended up scoring an all time SPL record of 123 goals ! Helped by goal scoring machines like Kevin and Fedja and Gui who together scored 63 pct of their total. However in the final games of the season they let the title slip out of their hands or feet…or heads. ! Having scored the most goals this season and having the second best defensive record in the league might leave you with the question why they only ended on the 4th place ! 3th Gremio – Very solid team performance until the very end of the season. First year to operate under the Gremio name and despite losing the title they can look back at a successful season. They had a solid defense the third best in the league but scored a bit less goals compared to the other top 4 teams, 83 goals ! 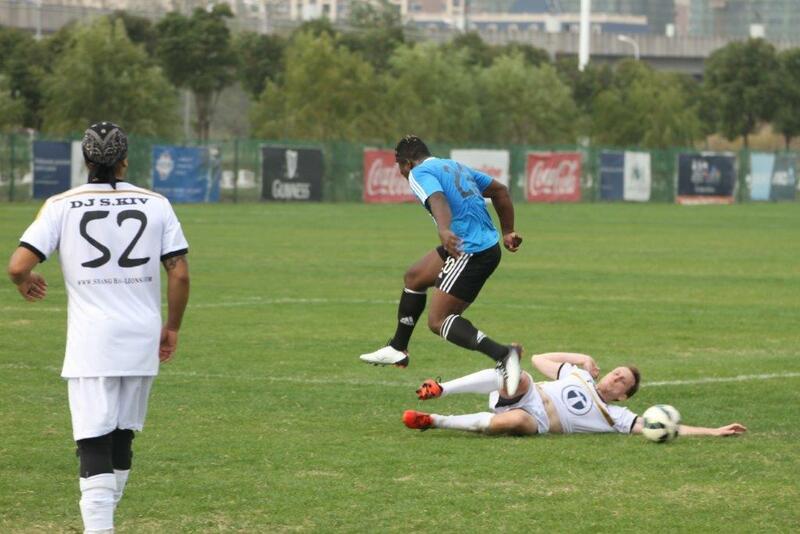 However some of those goals surely belong to the SPL “Best Goals of the Season” ! 2nd Cowboys – To say that the Cowboys were the surprise factor of the season is an understatement ! We never knew that Cowboys could play football ! They had a super season ending only 5 points behind the Lions. 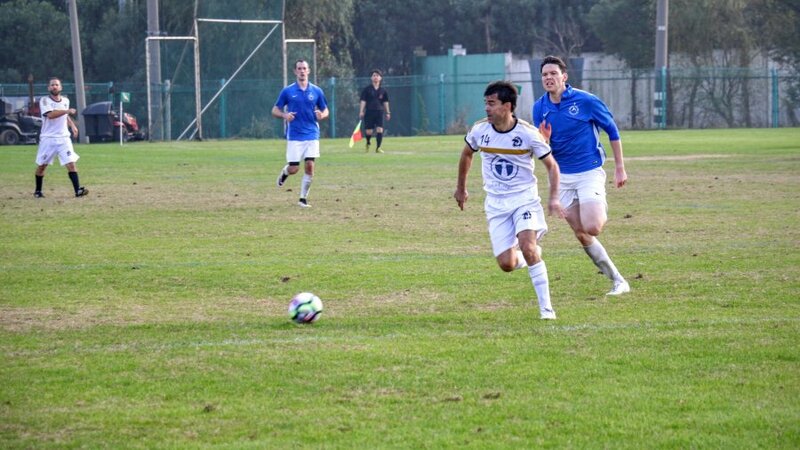 Their strength was their attacking duo Zhuang and Chen KL. 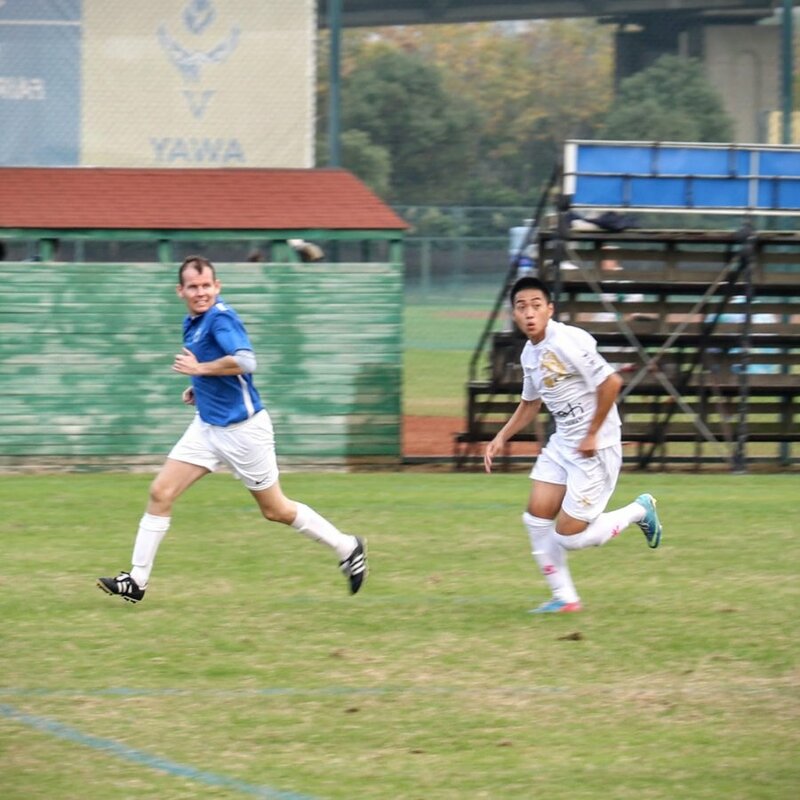 Zhuang became the SPL top scorer with 40 goals ! The cowboys reached over 100 goals for the season in their last game. Defense was not as strong conceding 43 goals but overall a fantastic result for them ! 1st Lions – The Lions thought they had lost it when in the last game of 2012 they lost against the Marlins 4-3. 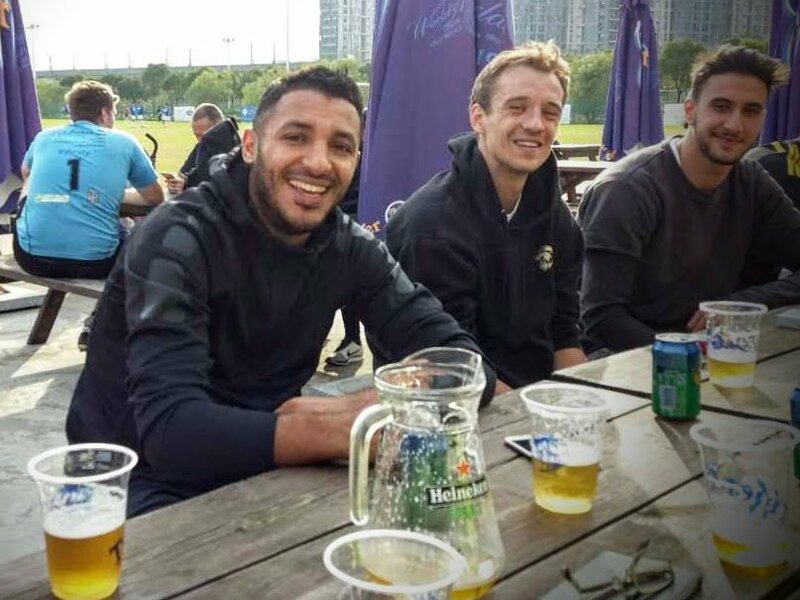 However after the game all players stayed back for a few beers to heal the pain as team ! It helps to always be positive and the conclusion of the day was that they needed to win all the games left for the season in order the be Champions ! This is exactly what happened. The secret of their success was by all means their defense as they conceded only 2 goals in the rest of the season and 18 in total. By beating their closest rivals in the last games of the season we can say that they deserved the Championship ! Let’s all celebrate the good end of the season tournament on the 16th of June followed by the SPL Party and the SPL awards Ceremony ! Thank you for being part of the SPL. You all made the SPL Special ! Lions, now it’s party time!!! 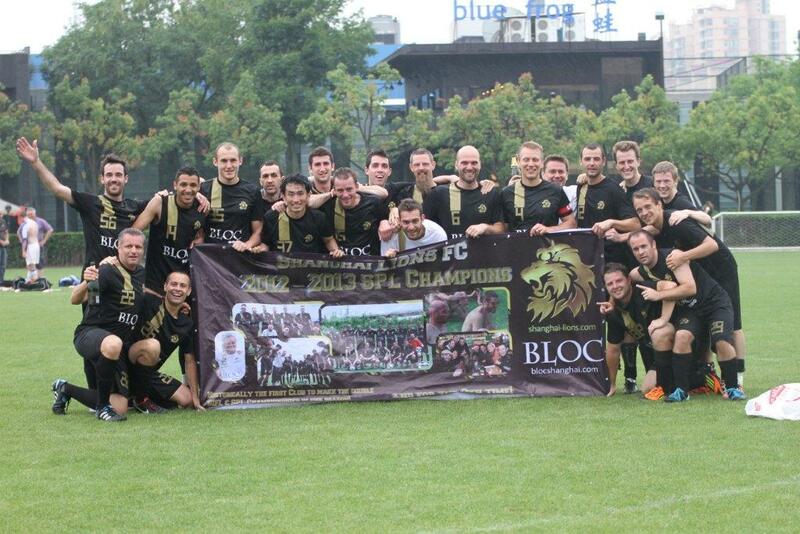 We have achieved what no other team or club has achieved before as we won both leagues in Shanghai the SPL and the SIFL ! Before the start of the season we could only dream of it but once the season progressed we saw more and more motivated Lions. Our trainings under the great supervision of Azz and Simon were well attended even last week we had 30 Lions showing up ! 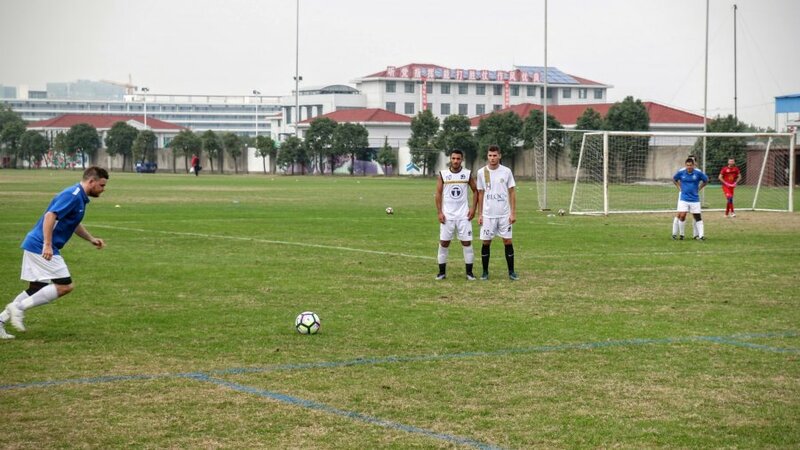 No other teams in Shanghai are having such well organized trainings and have so many motivated players. 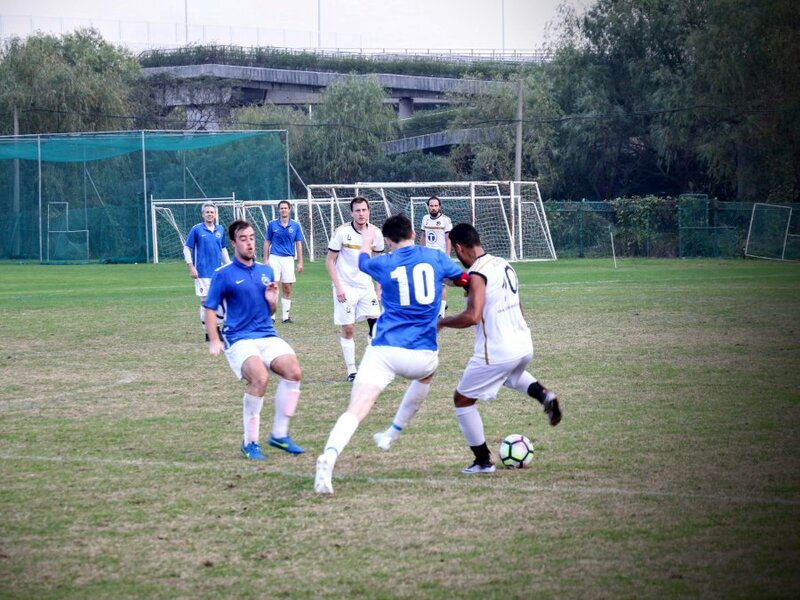 As the Saturdays Lions were off to their best start ever in the SIFL it motivated the Sunday Lions to catch up in the SPL. Turning point to me for the SPL was in December when we lost 4-3 versus the Marlins. Extremely frustrated all the players stayed back after the game to have a few beers and we talked about the rest of the season. Ironically we said if we win all our games we will be Champions ! Exactly that’s what happened we locked our defense and started to score goals like a machine ! A long the way our closest opponent started to feel the pressure. Especially against Gremio we played our best game of the season on all aspects of the game were better and the result was a 6-0 victory ! Next up were the Cowboys last week and again it was our fitness and good balance in the team of course helped by our team spirit that brought us the title. Gremio yesterday lost against the Cowboys so before we started versus the Marlins we were officially SPL Champions. The first 45 minutes we adapted to the Marlins style of football with long balls skipping our midfield. Thanks to Jack we got at least something to fight for in this game as they Marlins took the lead 1-0. The second half we wanted to win the game under the Captaincy of Joel we started to show our teeth. 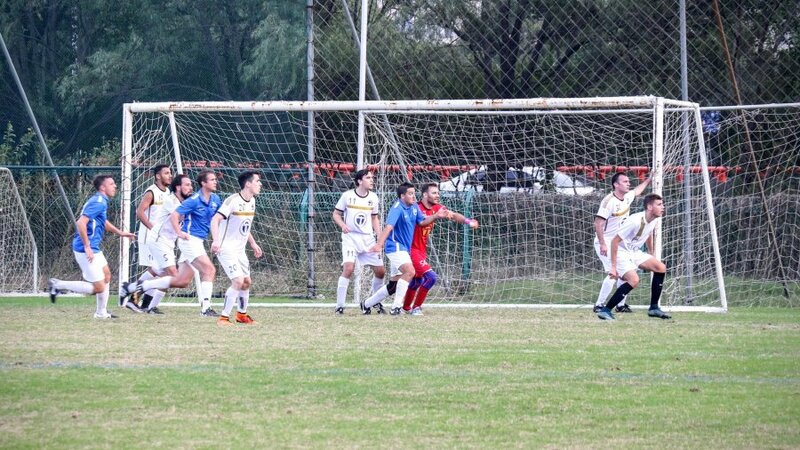 His brilliant cross reached Benji who was running faster than the Maglev train and he made no mistake in front of the Marlins Keeper 1-1 ! The joy of playing started to come back and before we knew it we scored the winner 2-1 an easy tip in for Joel. After that it was time for the substitutes to come in and our goal was to keep the lead. Credit to the Marlins who kept on fighting until the last minute and kept our defenders very busy on the day. On Saturday we had our last league game versus the Shooters ! First half we were not playing well partly because there was nothing at stake anymore. Yes we hit the post and the cross bar but couldn’t find the net ! In the second half we showed that our fitness level is much better than the Shooters and started to dominate the game. 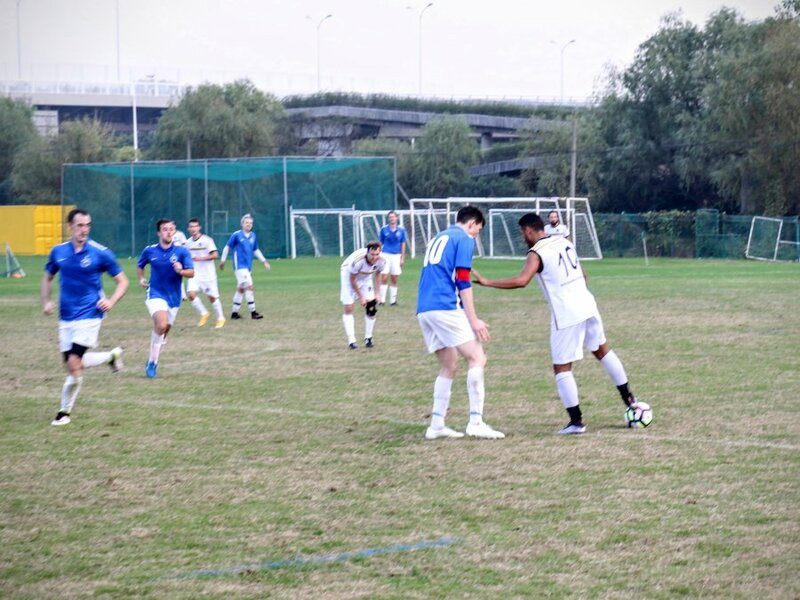 Two good combinations ended at the feet of Antony Nobile who scored both goals. It could have been 3-0 if Simon scored his penalty. 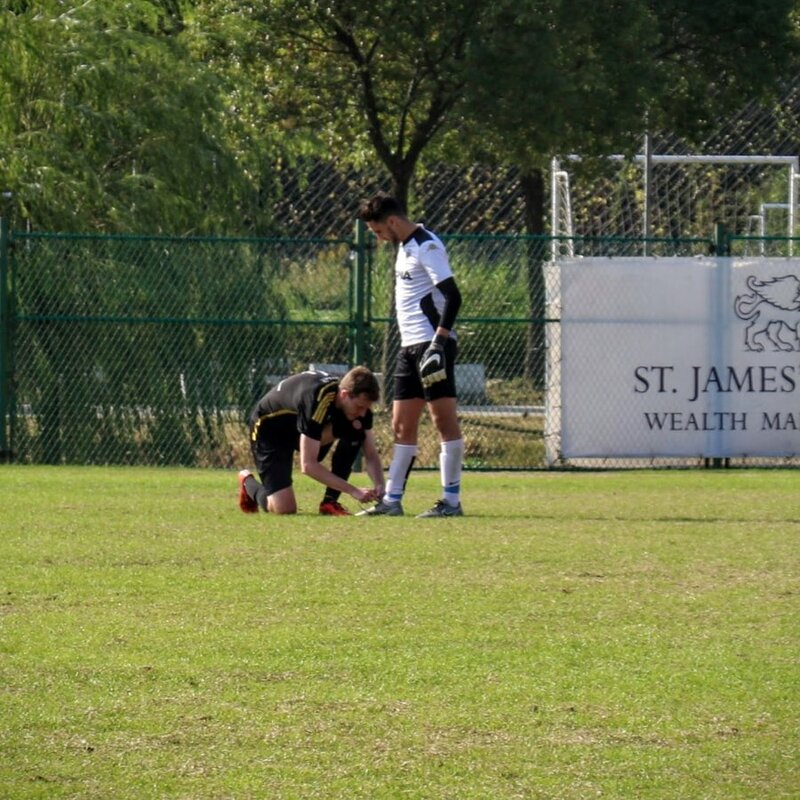 Its was my mistake to let him take the spot kick as I should have known that he wanted to keep his record of no goals scored for the whole season. Well done Simon ! You might be up for a reward here ! 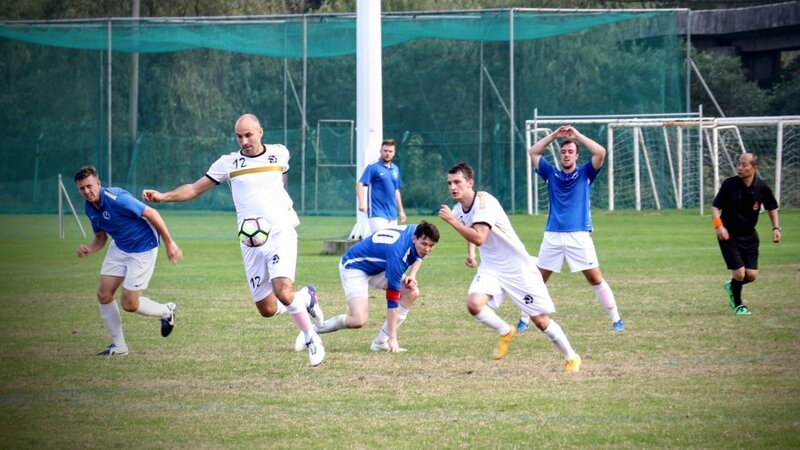 SIFL season we ended with 16 wins + 1 loss + 1 draw and we scored 87 goals and conceded 20 ! We ended the season 19 points ahead of the Shooters ! Thomas flew all the way from Sydney to play the last 5 minutes of our game versus the Shooters so that he would be entitled the Championships medal ! At least he got a taste of winning as since he left Shanghai last year we only lost one game… coincidence??? We have the SIFL Semi Cup final ahead of us this coming Saturday and we are going to put a very strong Lions team versus the Shooters ! So please all come to the training ! On June 8th, we will hold our official Lions Champion(s) Party! We expect everybody to come and make this a memorable event ! 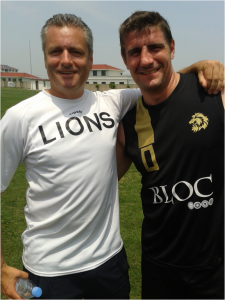 To all the Lions who have contributed to the success this season I like to say a very big THANK YOU ! Incredible ! I am proud to be a Lion !